Entering into writer-director Dan Gilroy’s world of Nightcrawler, the audience has an uneasy feeling about its off-kilter anti-hero. Lou Bloom, played by Jake Gyllenhaal in a performance of tics and creepy smiles, speaks with a precise, businesslike confidence. Lou surveys the Los Angeles streets for crime, the bloodier the better, and hopes to catch them on video. Armed with a handheld digital camera, he listens to the police band and speeds to the scene of a crime or accident to capture the grisly details. And then he turns around and sells his footage to news outlets for a hefty fee. His carefully practiced verbalizations demonstrate his fortitude on the job, and yet he maintains a level of remorseless detachment toward his subjects. In a way, he’s more interested in being the best at something than reporting the news. 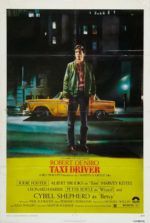 Not since Martin Scorsese’s Taxi Driver, The King of Comedy, or Bringing Out the Dead have we felt so removed from our own world and transported into one man’s perspective toward the urban surreality around him. When we first meet Lou, he’s chopping up metal fences and stealing manholes for scrap yard sale. He scours the night for similar prospects, stealing where he can to hawk for profits. One night, he witnesses freelance videographer Joe Loder (Bill Paxton) recording as two policemen pull a woman from a burning car crash. When he sees the footage on television the next morning, he’s inspired to try videography himself. After securing a camera and police scanner, Lou learns the trade by listening and observing. He makes his first sale by getting closer to a shooting victim that the other guys are willing to get. He also has a natural eye for framing and angles. And afterward, he hires a paid intern, the homeless Rick (Riz Ahmed), who serves as navigator and assistant. Everything he learns, he learns online, absorbing information like a sponge, retaining and applying it. What’s strange is that Lou doesn’t seem to sleep or eat, nor does he have any kind of meaningful human interactions. He looks thin, emaciated even, and his intense eyes carry dark circles. He watches a lot of television, and he regularly waters his houseplant. But what else is going on with Lou? There are no definite answers in Gilroy’s excellent script. Consider how, as Lou’s business begins to grow, his ambitiousness grows too. He happens to love what he’s doing. “Television news might be something I love as well as something I’m good at,” he remarks. With Nina, he exploits every ounce of his leverage. He comes on strong and asks her out for dinner one evening; but rather than build a personal romantic relationship, he threatens not to sell his clips to her station, thus putting her job at risk. In exchange for his devotion, he expects sexual recompense. And while Gilroy carefully avoids what happens between Lou and Nina behind closed doors, it’s undoubtedly strange and, as hinted, unfulfilling for both parties. But for Lou, establishing a sexual connection is not only his sole chance for physical contact, but it’s an added benefit of his business relationship. At first, Nina reacts with aversion through resigned acceptance, whereas later Lou’s talents seem to turn her on. One cannot help but think of Sidney Lumet’s Network and the relationship between Faye Dunaway and her producer William Holden. Indeed, Nightcrawler is very much a media satire in the same sense. Lensed by cinematographer Robert Elswit (There Will Be Blood), the film’s nighttime scenes have an incandescence to them: green and burnt orange streetlights glow; head and brake lights flicker; and in the blackness, nothing is so dark that it’s unintelligible. L.A. hasn’t looked so alive, mysterious, or downright wild since Michael Mann’s Heat or Collateral. Elswit and Gilroy also deliver a number of shot-on-location chases where, speeding after police cars or racing to the scene of an accident, Lou maneuvers the road like an expert driver. 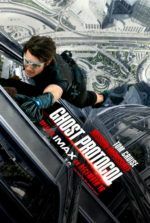 Editor John Gilroy, the director’s brother, pieces together these chases in a seamless sequence, exhilarating and fast-paced. But the most exciting component of Nightcrawler is Gyllenhaal. 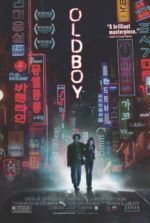 He’s transformed himself physically and, despite what some might call his unique appearance, disappears into his carefully mannered portrayal—strange, funny, and even a little frightening. Nightcrawler belongs on a shortlist of the most challenging films of 2014, at least in terms of how viewers will understand its tonality—it’s the kind of film where audiences won’t know whether to laugh or be appalled. After all, Lou is unquestionably a psychopath of sorts. But sometimes psychopathy is what one requires to be successful, and Lou certainly is that. According to the FBI’s website, psychopaths are common in the workplace and often result in prosperous, charming individuals whose disorders are not immediately apparent. The workplace psychopath is “impulsive and irresponsible” and lives a “predatory lifestyle” that nonetheless produces results. This is Lou Bloom. 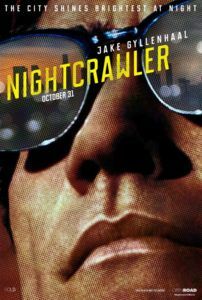 And beneath Nightcrawler’s outward critique of the media’s desperate need to see and record human atrocity for mass ratings, there’s a more disturbing character study about Gyllenhaal’s fascinating and fantastically played a psychopath who’s carved out his very own world and mastered it.